Path racer for St. Petersburg, Fla.
Nearly every part of this bike was made in the USA, from the Thomson cockpit to the White ind. drive train. The final edition has a black Brooks cambium saddle and a White ind. freewheel.The rims are Hed belgium C2 and the bike is fitted with a King headset. 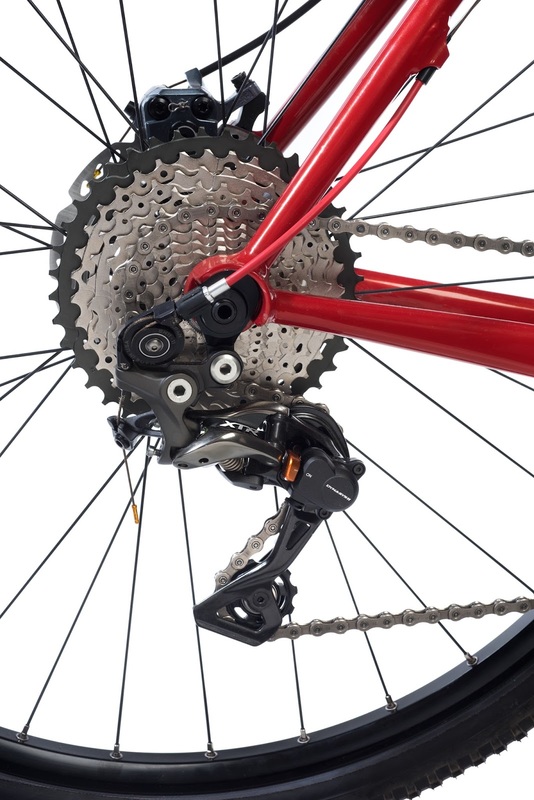 The gearing is 40-17, a favorite for SSCX bikes. This bike is absolutely silent rolling down the road. This is a sensible build- Shimano 5800 group with CX-77 mechanical disc brakes. The rims are Hed Belgium+ which mate up well with Bruce's 700x43 tires. This one also has a Brooks B-17.......not a bad choice for value in a real leather saddle. I have not test ridden this one yet-that will have to wait until tomorrow. After that it will be boxed up and begin its long journey east. Here's a 2005 Bruce Gordon road bike in my size. Wish I had the money-it is stunning. This table is supported by about a dozen dead bicycle frames. Not a bad idea unless you are a Bridgestone devotee. Here's a view of the work shop with a table covered in tooling. Bruce in his office totaling up the daily receipts. We had a nice visit and a great lunch. Now I'll be able to finish off the assembly of the two Schnozolas and get them out the door in the next couple of weeks. 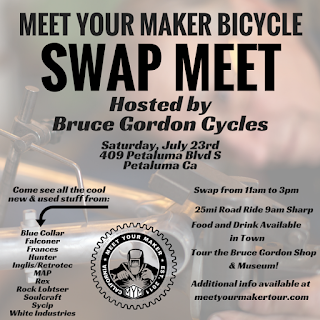 Bike swap at Bruce Gordon's shop ! 50 shades of OY ! This show bike is for sale. I am needing room in the shop so it must go. I did put a new stem, a steel one that I built that raises the handlebars about 1 1/2". This is a good bike for a 5'10" person who doesn't give a crap about brakes. You could put brakes on, though.....there's a hole in the fork and the rear brake bridge of you want to be sensible. Call me at the shop weekdays at (831) 429-8010. I have been riding it a little....it is a lot more fun with the new stem. Yes, folks. Here are two of the NAHBS bikes that are for sale. 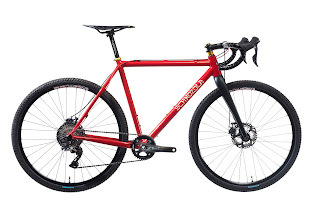 The 650 gravel bike is 7005 aluminum and the fixed-gear path racer is steel. These bikes are available and all you have to do is call 831-429-8010 and schedule an appointment at Rock Lobster cycles in Santa Cruz, Calif.
Two more bikes are at Bruce Gordon cycles in Petaluma and you can reach Bruce at 707-762-5601. He has the touring bike and the 'Grinduro' 700c gravel racer. 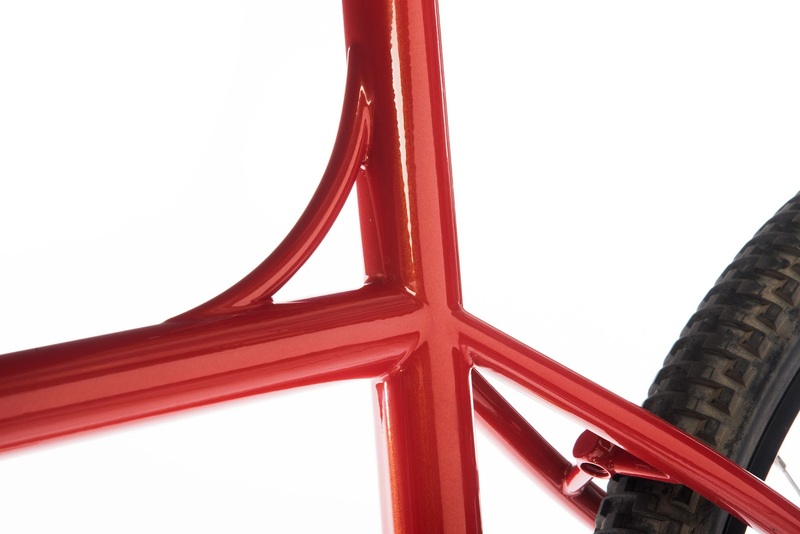 These bikes are a collaboration of two of the most experienced builders that are still alive ! Not only that, we are still at work making bikes. Think about it.......nearly 90 years collective bicycle frame building experience......and all for such a deal. 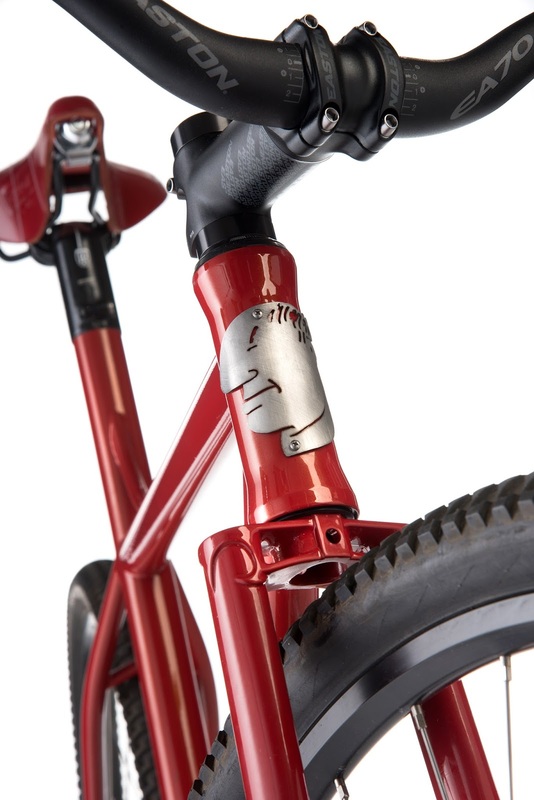 Check it out.........solid bikes, big tires, red paint. What more could you want ? ........Don't answer that ! Schnozola was officially unveiled last weekend at the NAHBS in Sacramento, Calif. So, how was the showoff us ? -Feh......hard to tell what folks thought of our bikes but everyone who came by left with a smile. I figure that they kind of 'get it' , funny name but pretty serious bikes here. Now that the show is over we have a selection of four compete bikes for sale at New York prices or even lower-such a deal , in other words. # 1 is the Dynamic Kosher Trail 650 gravel racer. The 7005frame and Enve fork contribute to this bikes light weight . You can have this bike ( for a 5'8" rider ) for only $ 3,850. This is at least $ 500 less than the regular price and it is unridden. 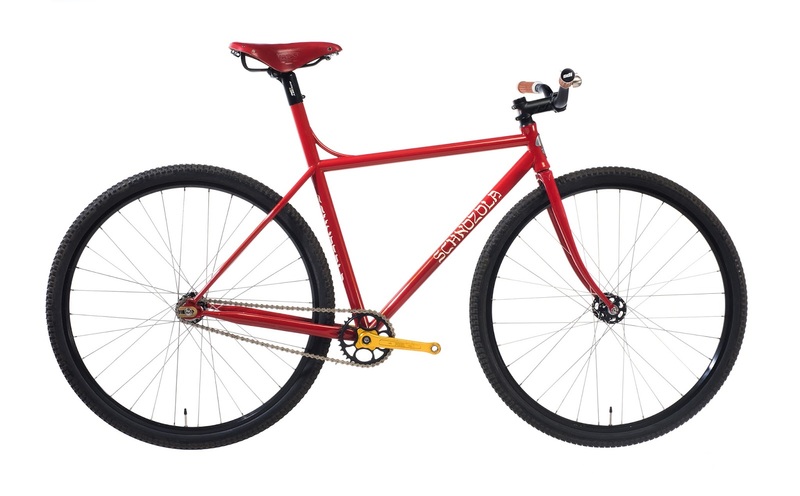 The next offering is the Gentleman's fat tire fixed gear dirt track pursuit bike, especially if you are in pursuit of lunch. This was extremely popular with the photographers at the show and is a real hoot to ride. This one is $ 2,850 and is for a 5'10" rider. 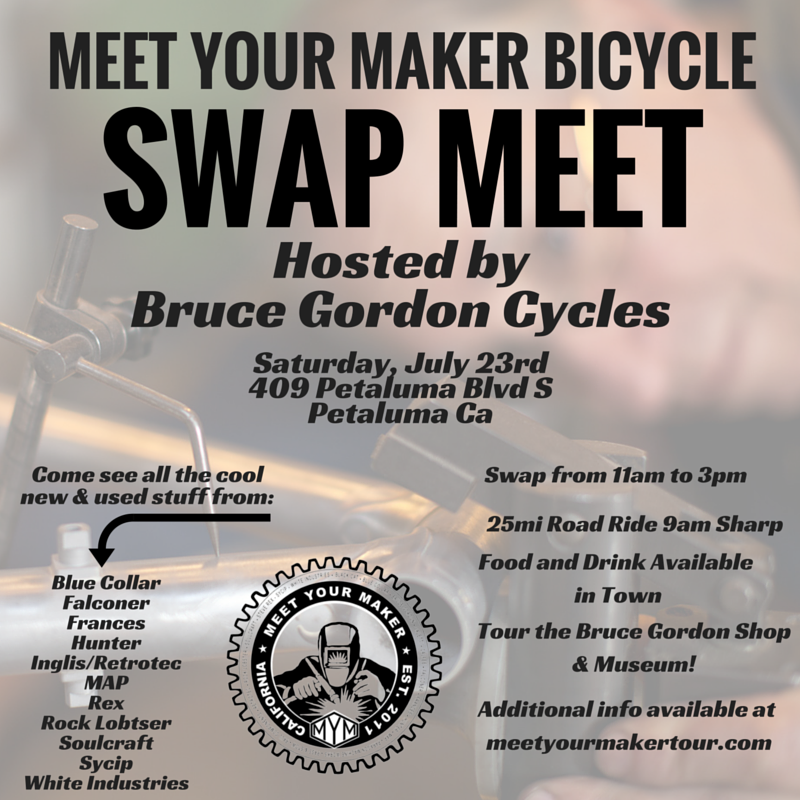 Both of these bikes can be seen at Rock Lobster cycles (831)429-8010 and the two other bikes not pictured are at Bruce Gordon cycles ( 707) 762-5601. The two at Bruce's shop are his touring model at $ 3,950 and the original Grinduro steel gravel racer $ 4,250. Both of these bikes are new and reduced for a quick sale. Come check them out if you want to get something very unique and special.